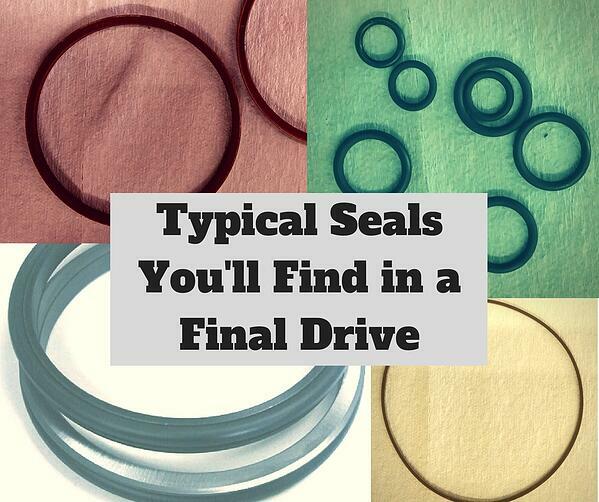 Seals are important because they keep fluid (hydraulic fluid, gear oil, lube, etc.) where it needs to be and keep contaminants out. A part of keeping fluids where they need to be involves keeping certain fluids separate, like keeping the hydraulic fluid separate from gear oil. When seals begin to fail, very bad things start to happen. A leaking seal means you final drive is losing fluids and gaining contaminants -- both of which can lead to damage. Damaged seals quickly compromise the efficiency of functionality of your final drive motor. 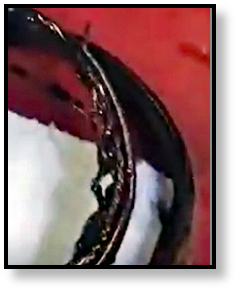 If seals are damaged to the point that they start to come apart or disintegrate (as seen in the image shown), they become a very dangerous form of contamination that can clog filters and more. That’s why professionals replace the seals and o-rings when reassembling a final drive motor -- seals are too important to take a chance with. As we mentioned earlier, final drives have quite a few seals and o-rings. These seals come in different shapes and different sizes while serving very different purposes. The face seal (also known as a floating seal, floating face seal, main seal, or a duo-cone seal) is a mechanical seal located where the axle and the hub come together. It is comprised of two large rubber o-rings and two precision ground metal rings. It is one of the most important seals, and is exposed to the most contamination from the work site. Common lip seals are used on the axle. They separate the axle hub from the hydraulic oil in the main housing. In radial piston final drives, a quad o-ring seal is used on the hub and the main housing to seal the cam ring. It is about 8 inches in diameter. To seal the brake housing to the main housing another quad o-ring seal is used, and it is about 4 inches in diameter. There may a brake seal used to seal the brake piston and it is about 3 inches in diameter. It is either a simple o-ring or a lip seal in a metal housing. Don’t try to use seals that are cut, cracked, or damaged. Be careful about substituting seals and o-rings with a different kind -- it really isn’t a good idea unless you know quite a bit about seals. Seal materials are chosen for things like their compatibility with fluids, operating temperature, pressure, and shaft speed. That’s also why buying cheap seals isn’t always a good idea. Follow manufacturer’s instructions for installing seals. Another good idea is to check online for practical videos that show seals being installed, like this one from Caterpillar about duo-cone seals. Most professionals recommend that you use light lubrication when installing seals. Most seals can be installed by hand with a pusher tool of some sort, although some seals -- like face seals -- require special tools and an arbor press. Seals are very important to the proper function of your final drive motor. Seals should be replaced when they begin to leak, show signs of damage, or when a final drive motor is being reassembled. Don’t forget that seals and o-rings should be installed carefully.